SHIFT STYLE DRESS. ONLY SMALL BUT BROWN IN COLOUR. SHORT MINI LENGTH. Fitted Body-Con dress. Perfect for a size 8. Topshop 10 (also fits an 8) White Floral lace Athleisure Sporty layered Dress with black collar band. Lined with comfy white Strappy body on dress. Falls just above the knee on me (5'4). So beautify and light, perfect for summer. Any questions please ask & check out my other items! UK 12 / US 8 / EUR 40. It features a crew neckline and has a zip fastening. It is made from an ivory/green coloured material and would be ideal for different occasions. Main Colour: Ivory. Pattern: Striped. Length: Knee Length. Floaty, Flowy, Fit & Flare. Round Neck. (Unstretched) Waist- 34cm (Elasticated Streatchy waist). Size- UK 10. It features a crew neckline and has a zip fastening. It is made from a white coloured material and would be ideal for different occasions. Neckline: Crew Neck. Main Colour: White. Gender: Ladies. Sleeve Type: Short Sleeve. The top of the dress is lined. Versatile dress. Browns Yellow Oranges Purple Greens Blue. Subtle empire swing cut. Full length bell sleeves. Brown floral design Length ~ taken from shoulder ~ down back of dress to hem ~ approx: 31.5". This dress may fit smaller / larger sizes than those stated in label. Cut Out Skater Dress. concealed zip fasten back. Size Type :PETITE. unlined skirt. round neck. white, pink, brown, blue and black. Bust : 32 A-C. 98% Polyester. UK 10 / US 6 / EUR 38. This can take a while so we aprieciate your patience during this process.and we will always do our best to help if and when they occur. Reason for sale: Getting rid of unwanted clothes before I move. A lovely grey and white mottled dress with overlay top. 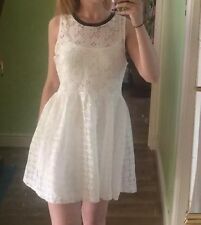 Cute dress with cross pattern on grab a bargain ! Dress By Top Shop ..Size 12. Condition is Used. Dispatched with Royal Mail 2nd Class. 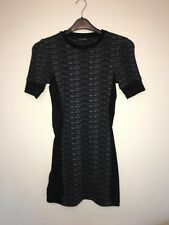 Women Topshop Black Mini Dress UK 8 RRP 55. Condition is New with tags. brand new in perfect condition Dispatched with Royal Mail 2nd class. Black and white stretchy dress with zip fastening at the back. Pink dip-dye soft jersey dress. UK Size 12 (EU 40, US 8). Block blue and grey pattern. TOPSHOP Funky Smock Dress/ Size 14/ Heart Print. Excellent Condition. Excellent Condition. Condition is Used. I t fastensa t theback andh as a l on g zi p.
Topshop Size 14 Crepe Shift Dress. Condition is Used. Dispatched with Royal Mail 1st Class. Top Shop Grey Maxi Dress Size 12, Bust 36", Length 42" With Stretch, V.G.C. 〉 Knitwear. 〉 © Fashion She Wrote. 〉 Plus Size. 〉 Shorts & Hotpants. Round neckline. Short sleeves. Loose fitting. Polyester, viscose, elastane. Machine washable. Stunning dress from Topshop, beautiful floral and angel sleeves. Bloggers favourite. Brand new with tags. SMART PLAIN CREAM/IVORY DRESS WITH ZIP TO BACK. UNDERARM TO OTHER - 16". We aim to improve the lives of every vulnerable child and young person in the UK. Every £1 you donate will help us change a child's life. Hobbies, Sport & Craft. MAKE A DIFFERENCE. FEATURED CATEGORIES. There is a good strong stretch to the fabric.